Employment growth of 50,900 in June beat the consensus view of a 16,500 gain in jobs. What's more, these are mostly full-time jobs. 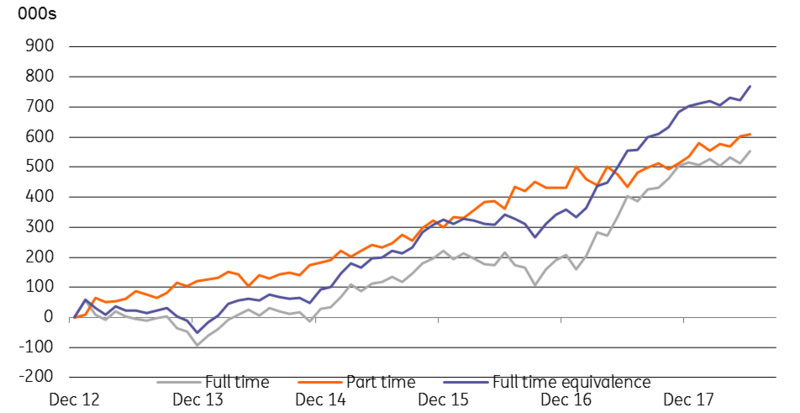 Strong growth in full-time jobs in June helped to shift a labour market that was beginning to be dominated by part-time jobs. Our full-time equivalence measure suggests that labour demand is now picking up strength. Were this to also be reflected in some improved wages growth, it could radically change the outlook for the Reserve Bank of Australia, which most forecasters see on hold all this year, and possibly all of next year too. While the labour markets in Victoria and New South Wales seem to be alternately chopping up and then down for no significant aggregate trend, this month, an outsize 14,800 gain in Queensland has provided most of the upwards push, making this state the second biggest job creator year to date at 26,600, behind New South Wales at 62,600, but ahead of Victoria at 21,900. The local government puts the gains down to Back to Work programmes and re-skilling, though tourism associated with the April 2018 Commonwealth Games, and heavy investment in LNG export infrastructure projects and population inflows from expensive property areas such as Melbourne and Sydney are more likely to be doing the heavy lifting. The June employment data were certainly an outsize month on month bounce. Though given the volatility of this series, not that eye-watering. This data will only likely become a significant market mover if repeated in July.